Day 1; Arrive Entebbe International airport. You will be met by a guide from AA SAFARIS AND TOURS who will transfer you to your hotel room in Kampala but if you arrive in the morning, our guide will take you to interesting places around for a City tour in the land of the 7 hills Kampala. These include Kasubi Tombs, Uganda Museum, African Craft Market, Namirembe Cathedral, Mandela stadium, among others. You will not be able to visit many places though because you will not have enough time and the given the traffic conditions in the country. You will sleep ate either of these depending on your budget. Luxury Kampala serena Hotel or Sheraton Hotel. 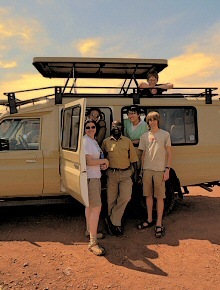 Day 2; Transfer to Murchison falls national park. After breakfast you will meet your safari guide who will drive you to transfer to Murchison Falls National park through through the famous Luwero triangle or Hoima towards Masindi. Proceed through the park stopping at the top of the falls which is a fantastic sight. At the top of the falls, you will see the longest river in the world forcing its self through a narrow gap in the rock (only 7 meters wide), before ferociously plunging down 43 meters. From here we will continue Game viewing on the way is very good; look out for hippos, elephants, buffaloes and many other animals, seen grazing on the banks of the river. You can also to Ziwa Rhino Sanctuary but it is optional. Day 3; Safari game drive and Boat ride on Victoria Nile. After a cup of tea, go for the early morning game drive on the northern bank where your guide will help you spot elephants, lions, Cape buffalo, Rothschild giraffes, Harte-beasts, water-bucks, oribi, bush-bucks, Bohr reed bucks, hyenas, and on rare cases leopards. Return to the lodge for mid morning breakfast and relax at the lodge as you wait for lunch. After lunch, you will take an afternoon boat ride to the bottom of Murchison Falls which is normally the highlight of a trip to Murchison given the fact that give you an opportunity to view the animals at a close range. Like the thousands of hippos as well as high population of Nile crocodiles, lots of birds like the brightly colored kingfishers and bee-eaters darting along the riverbanks. If lucky, you may see the rare and prehistoric looking shoebill, which is a cross between the dodo and a dinosaur. The boat takes you to the base of the falls which only adds to their impressiveness. Dinner will be back at your lodge. You will go for another early morning safari adventure on the Nile to the delta where you will have the opportunity to watch variety of wildlife including the Nile crocodiles and many other water animals. Later in the after noon, you will go rafting on the Nile . Overnight at your previous lodge. Day 5; Murchison Falls – Hoima. Budget: Kontiki Hotel (BB) but can be FB on a high budget. After breakfast early morning, you will go visit the The Kibiro Hot Springs and Salt Gardens found 35km North of Hoima Town in Kibiro fishing village, Kigorobya Sub-county near the shores of Lake Albert. Later you will embark on the journey to Kibale National park. The home of the largest number of primates in Africa. Day 7; Chimpanzee Trekking safari and Nature walk in Bigodi Wetland. Day 8; Kibale Forest to Semliki national park. Have breakfast this morning and drive for 3hrs to Queen Elizabeth National Park; go for a morning game drive in search of the wild game view a beautiful panorama of the great lakes of Lake Edwards and Lake George, then also their gutter the great Kazinga channel. Expect to see the elephants, lions, buffaloes, kobs, the Python, hyenas, warthogs, birds’ hippos etc. you will have a buffet lunch at Tembo Restaurant after which you will go for a boat -cruise along Kazinga Channel which is the natural channel between Lake Edward and Lake George and here you expect to see lots of birds, highest population of hippos, crocodile and then return to the lodge for a night and dinner. Mid range; Institute of Ecology. Day 10; Free Day. Choose optional activity of interest. Lion Tracking for an up-close view of the lions. @USD 50 Per person. Day 11; Transfer to Isasha sector of Queen Elizabeth park. In the morning right after breakfast, you will drive to transfer to the Ishasha sector of Bwindi. Do a game drive in this sector to search for tree climbing lions and then later in the afternoon relax at your lodge. Luxury – Ishasha wilderness camp. Moderate-Gorilla safari lodge, Gorilla mist camp, Nkuringo cottages. Luxury – Gorilla Forest Camp or Volcanoes Bwindi safari Lodge or Buhoma Lodge or Mahogany springs Hotel. Day 13; Gorilla Safari in Bwindi national Park. You will go for briefing at the headquarters and registration before you can start on your gorilla tracking which is unpredictable therefore, it is difficult to foresee how long you will be in the forest. The adventure of tracking the gorillas in their natural ecosystem of the park will be passionate for the adventurous tourists and may take up to 10hours thus the reason why you have to be ready to a walk long distance in steep and muddy conditions, sometimes with rain overhead before you meet the gorillas. “The excitement of seeing the gorillas makes it all worthwhile and you will be allowed to spend 1 hour following the gorillas and taking photos. After breakfast, you will go visit the source of the Nile and then later drive to transfer to Kampala. Buy some souvenirs in Kampala , have lunch and then transfer to Entebbe. Depending on your flight departure time, we shall transfer you to the airport to catch your onward flight.